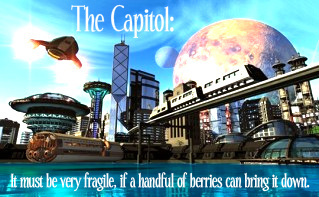 The Capitol. . Wallpaper and background images in the The Hunger Games club tagged: capitol the hunger games quote. This The Hunger Games fan art might contain zakelijke district, downtown, zakenwijk, centrum, and multiplex. I love that quote from the book! That's really good! I like it! And the quote. the only image so far with absolutely NO hate.